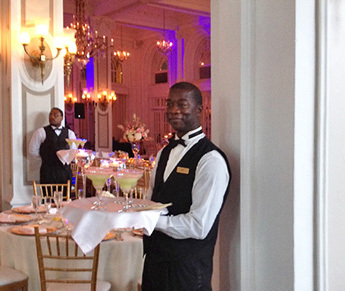 Weddings are the pinnacle of planning when it comes to special events. There are so many thing that need to be arranged… the photographer, the cake maker, the gown, the bridesmaids, the decorations, the music - it can be overwhelming. 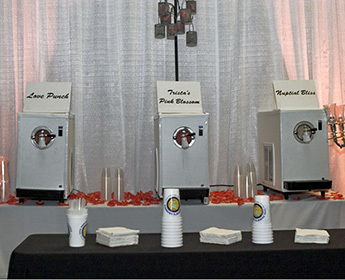 Let us help out with an easy, affordable way to provide unique frozen drinks that will make your wedding even more memorable. We can add a unique touch with one-of-a-kind drinks named especially for your occasion or you can choose from over 100 fantastic flavors of daiquiris, margaritas, mojitos and many more offerings. We have a frozen drink for every wedding, from the Wedding Bells to the Nuptial Bliss (names of frozen drinks). Your guests will love these delicious alternatives in addition to or instead of the common choices of beer and wine. Save the expense of a full bar and opt for a creative approach that everyone will love. Even Grama may let her hair down with a Strawberry Daiquiri, you never know! We won't forget the kids. 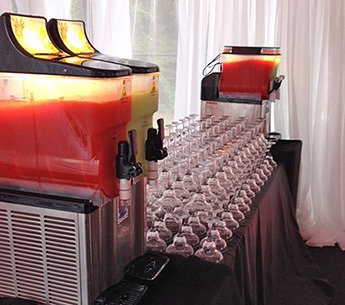 Our 100% fruit flavored slushies are always a hit with the children at any event. After all, what kid doesn't like a frozen slushie! Call us early at 404-352-9996 so we can take one more thing off of your wedding planning list and give you the peace of mind that everything will go perfectly with your frozen drinks.